Quantib and QMENTA, two innovators in the field of neuroimaging, have decided to bring their forces together to build the first decision support system for stroke. Their aim is to optimize clinical decision-making by supporting accurate diagnosis of ischemic or hemorrhagic stroke in the acute stage, thus improve the patient outcome. 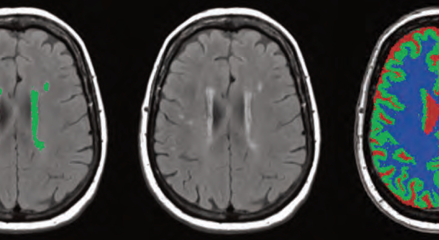 To achieve this, they will be using state-of-the-art machine learning and deep learning techniques with Quantib's biomarkers on QMENTA's advanced platform in order to provide objective, automated, and quantitative analysis of CT brain scans. Quantib strives to improve patient outcomes by supporting physicians with cutting-edge software providing insights of unprecendented value. Using advanced deep learning techniques, Quantib’s products can detect anomalies in tissues earlier than would be possible with the naked eye. Current development focus is on the implementation of a complete neurosuite including solutions for detection, classification and diagnosis of dementia, stroke and brain tumors. Quantib will lead the collaboration with clinical experts needed for image collection and annotation. Tailor-made tools for image data annotation will be provided to support the experts. Based on the annotated data, Quantib will develop, evaluate and optimize the extraction of a comprehensive set of CT imaging biomarkers to allow for the development of a stroke classifying algorithm. In addition, Quantib will implement the ASPECT score and will embed it in user-friendly support software. The ASPECT score is a currently widely accepted decision tool measuring the extent of early ischemic changes and predicting functional outcome of the patient. In the final stage of the project QMENTA will support Quantib by integrating the newly developed CT image analysis tools into the QMENTA platform. The end product will be a set of novel clinical decision support tools based on machine learning and deep learning techniques allowing physicians to diagnose patients with stroke faster and more accurately. QMENTA develops technologies to better understand the human brain and the neurological disorders. The offered platform is cloud-based with advanced data management and proprietary data analysis tools in addition to state-of-the-art 3D visualization capabilities. With the aim of helping researchers and doctors to seamlessly analyze millions of imaging records the platform automatically identifies anomalies, thus creating a reduction in time and R&D costs. The platform can support various aspects of the workflow for neuroimaging research and collaboration by bringing data and algorithms together, thus, accelerating the discovery and development of new therapies for neurological diseases. QMENTA is responsible for the design of the user interface for the stroke decision support tool. The algorithms created by Quantib will be integrated with the system using QMENTA's Software Development Kit architecture. QMENTA will develop a decision support system based on advanced machine learning and deep learning techniques with part of it being a hierarchical features space. The system will integrated with the stroke software and will continuously be updated as new data becomes available. 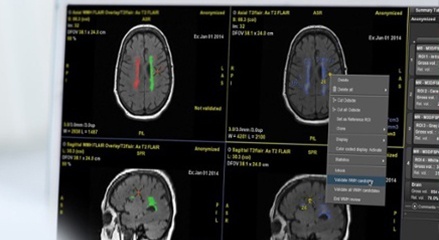 QuantibTM Brain provides white matter hyperintensity and brain tissue quantification. It offers a tool to objectively assess brain changes in longitudinal exams in neurodegenerative disease. QuantibTM Brain allows you to download the examination results in a comprehensive report including self-selected cross-sections and personal comments. How to measure the changing shape of the aging brain?